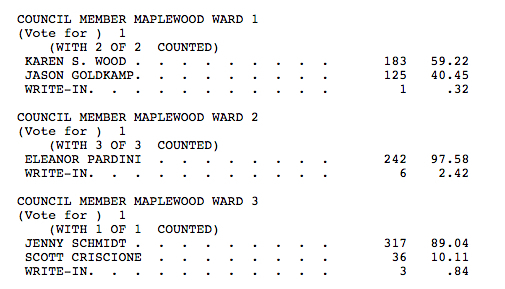 Maplewood voters re-elected incumbents Karen Wood (Ward 1) and Jenny Schmidt (Ward 3), as well as Eleanor Pardini (Ward 2) who ran unopposed. Wood took almost 60 percent of the vote, defeating Jason Goldkamp, who had been campaigning and canvassing since April 2018. Schmidt took 90 percent of the vote in her win over challenger Scott Criscione. Voters in Maplewood and Richmond Heights elected Nikylan Donato-Knapper and incumbent Brandi Herndon-Miller to the MRH School Board. They defeated Dale Chambers, who received 19 percent of the vote. Both Brad Jackson and Amy Peach had withdrawn from the race, but both received six percent.